Sign up soon for your opportunity to be a part of IGNITE 2019! In an effort to help men keep the fire of faith burning after the conference, the IGNITE Catholic Men’s Conference will have a large number of resources available during the conference and in the Program Book. After tremendous success at our first ten IGNITE Catholic Men’s Conferences in Syracuse, NY, we are planning on reaching 1,000 men in attendance at this full-day event to be held at the SRC Arena. 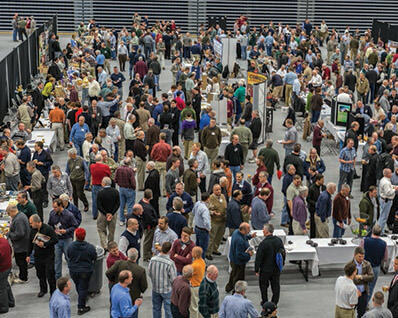 Last year, men attended from Syracuse, Buffalo, Rochester, Ogdensburg, Albany and Binghamton. We are inviting you to participate as a vendor. The doors will open at 7:00 am for vendor set-up. There are set up opportunities Friday afternoon/evening upon request. Saturday the attendee registration begins at 8:00 am with the conference beginning at 9:00 am. We will conclude around 5:00 pm. Included in the fee will be a draped table, listing in the event program, continental breakfast and lunch for two people. We are looking for sponsors to place ads in the program that will be given to all attendees.